Not With That Face | Is knowing really half the battle? I’m a child of the 80’s. Sure there was a lot of horrible stuff went on (Iran-Contra, Reaganomics, parachute pants), but it was definitely a simpler time for simpler people. A simpler time for simpler tastes, and my simple tastes were largely cartoon oriented. Cut me some slack, I was ten years old in 1984. It wasn’t until a couple of years later that I even knew who George Orwell was or why the year was so significant. 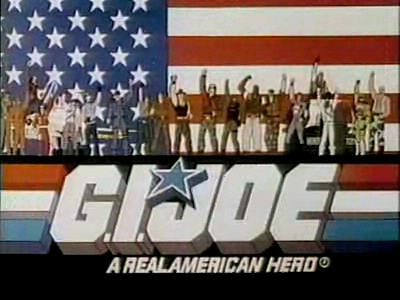 I watched the hell out of Transformers, M.A.S.K., Voltron, Robotech, Tranzor-Z, and, my personal favorite, G.I. Joe. I had nearly as much G.I. Joe crap as I did Star Wars crap. My brother and I held constant battles with some of the coolest toys ever to be made, and that was all fueled by the cartoon. This weekend my darling squeezle bought for me The absolute ultimate G.I. Joe box set ever, and, throwing her own sanity to the wind, watched about six hours of the masterpiece with me. Sure, she did fall asleep during part of The MASS Device, but it’s totally excusable. After watching a bunch of these episodes in a row I’ve discovered a few things that actually surprise me. First off, when I was a kid, I remember Dukebeing a total badass. From the first six hours of cartoon that I’ve watched so far, Duke has spent way more time being a prisoner of Cobra than actually fighting. What the hell is up with that? Sure, being a P.O.W. is heroic and I would never denigrate that, but getting captured repeatedly is just moronic. Yeah, I said it, Duke is a moron. My second “WTF” moment was the realization that Snake Eyesis constantly getting called on the radio. No lie, the line “Snake Eyes, are you there?” happened several times in the first couple of episodes alone. Hey Joes, can’t you remember that your elite ninja guy is mute? I’m just not thinking he’s going to answer that damn radio. Third, everyone in G.I. Joe is a horrible shot. I can understand making all the guns “magically” lasers because there is just no way to market a cartoon where 3/4 of the time on the show is spent with the heroes and villains reloading their guns. Plus, in the eventuality that anyone gets hit, a laser shot is way cleaner than being hit by a bullet. Not that anyone ever gets hit. For an elite squad, G.I. Joe, quite literally, cannot hit the broad side of a tank from thirty yards. All in all, while these things bug me, it’s not like I’m going to stop watching the episodes, or, heaven forbid, reevaluate my childhood. The lessons I learned from G.I. Joe I carry with me even today. For example, did you know that apple seeds are slightly poisonous? G.I. Joe taught me that.